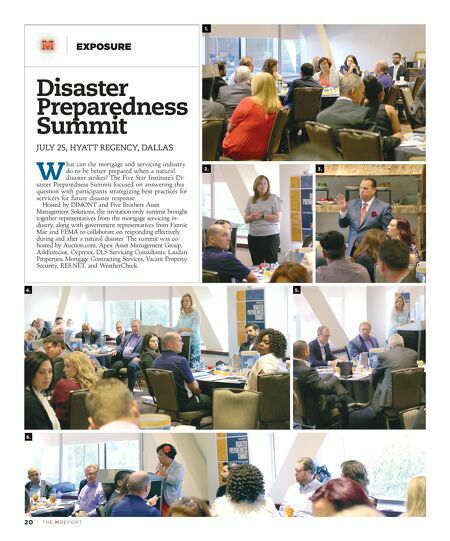 20 | TH E M R EP O RT EXPOSURE Disaster Preparedness Summit JULY 25, HYATT REGENCY, DALLAS W hat can the mortgage and servicing industry do to be better prepared when a natural disaster strikes? The Five Star Institute's Di- saster Preparedness Summit focused on answering this question with participants strategizing best practices for servicers for future disaster response. 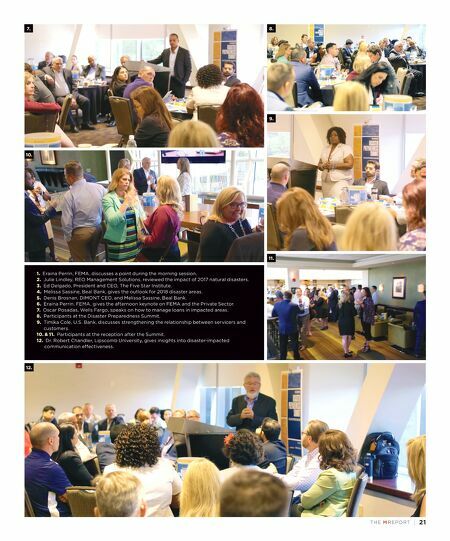 Hosted by DIMONT and Five Brothers Asset Management Solutions, the invitation-only summit brought together representatives from the mortgage servicing in - dustry, along with government representatives from Fannie Mae and FEMA to collaborate on responding effectively during and after a natural disaster. The summit was co- hosted by Auction.com, Apex Asset Management Group, ArkForecast, Cyprexx, DLS Servicing Consultants, Laudan Properties, Mortgage Contracting Services, Vacant Property Security, RES.NET, and WeatherCheck. 1. 2. 3. 4. 5. 6.